Instagram’s most famous animal rescue foundation is beloved by celebrities and millions of fans, and completely and utterly terrifying. Scrolling through the Black Jaguar-White Tiger™ feed is like seeing the beginning of Grizzly Man play out on social media. On this season of Keeping Up With the Kardashians, Khloe Kardashian and Kendall Jenner visit the Black Jaguar-White Tiger™ site on a quick getaway. They tussle on the floor with cubs, and one nibbles on Khloe’s shoe as she holds up her phone to document. Khloe accompanies the owner, Eduardo “Big Papa” Serio, into an enclosure filled with grown lions, where they briefly surround her. He calls her brave. Paris Hilton, Kaley Cuoco, Lewis Black, Debra Messing, Kellan Lutz, the Backstreet Boys, and Kate Walsh have also visited Serio’s compound and played with the animals he owns. Since launching in 2013, Black Jaguar-White Tiger™ has cultivated celebrity fans and 4.3 million Instagram followers with photos of Serio and his guests cuddling with a growing collection of over 200 lynxes, pumas, lions, leopards, jaguars, and tigers. Serio’s Mexico compound is becoming a buzzy destination, where the rich and famous can be photographed chilling with exotic animals without feeling guilty about it. These animals were rescued, after all. It’s raising awareness. It’s practically charity. As his followers continue to rise, the idea that it’s cool for people to interact with big cats as long as they’re rescued with love spreads. As though, somehow, human intention has an iota of sway over whether a cat decides to maul you or not. One attacks a loose sweater, another gnaws on my jacket cuff, one is on the waistband of my jeans, another pulls at my socks, while fingers are a favourite...T-shirts are pierced with teeth holes at best, and shredded to rags at worst (luckily I had the foresight not to pack Céline). My arms and legs are bruised and grazed, but the experience is worth every minor injury. While in Monterrey, he received a call from, his cousin, an animal expert with over 25 years of experience, sharing his frustration that a pet store was selling a baby black Jaguar with the purpose of drugging it and having it pose for photographs as a source of income. Eduardo, who always believed in equality and proper treatment of all beings, jumped at this opportunity and rescued Cielo from a life of captivity. That single event of selflessness and love gave birth to what today is The Black Jaguar-White Tiger™ Foundation. While Serio plans to create a 3000-acre “Stage 3” area for the mature cats, according to the Black Jaguar-White Tiger website, he has just eight acres of finished enclosures fully ready for his burgeoning horde of animals. Rescuing an animal from a life of photo-ops only to give it a life of photo-ops is blinkered behavior. Quickly buying over 100 exotic animals with no experience in keeping them and no actual place to put them is hoarding, not helping. This ignores the very real threat big cats in captivity pose for humans. 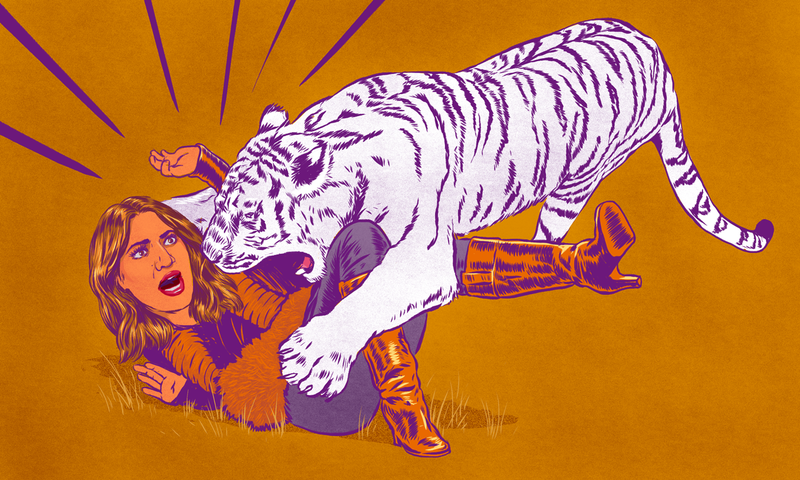 Remember when Siegfried and Roy’s Roy Horn got mauled by the tiger he’d worked with for years? There are 755 recorded incidents involving humans and captive big cats since 1990 in the US alone, according to Big Cat Rescue. In addition to deaths in zoos, people get attacked at sanctuaries without adequate safety barriers between humans and cats. We are all mesmerized by the beauty of these animals and the incredible efforts made to built this oasis and give these felines a second chance; suddenly Eduardo asks me if I want to play with two adult lions…before I could even think it through, he opens a gate to one of the enclosures and two fully grown lions come charging in our area and plop themselves just next to my feet. The combination of sheer terror and adrenaline was paralyzing, but I after a few moments I am compelled to pet the 500 Lbs. beasts and finally relax enough to start taking photos with my mates…equally terrified. That, of course, is until one of the lions decided that, yet again, my leg looks like a delicious snack and in a split-second movement, the lion turns around and locks his jaws on my ankle (in a playful way of course, if the cat was serious he could snap my leg apart with no effort at all). Eduardo, who consistently keeps a watchful eye on all of us and the animals, doesn’t miss a beat and quickly grabs the lions jaws and pry them open releasing my skinny and now dented ankle. I’ll take that as a sign that it’s time to leave before I turn into a meal; but not before watching Eduardo lying on the ground playing with 1-2-3 lions on top of him as if they were house cats!! Regarding Psychologists there are several reasons, both personal and a scientific one, so I’ll stick to the scientific one: I Love Sigmund Freud, I have read absolutely all his work, and I agree with most of it, but in a point that he is completely right is where he said that all people interested in studying Psychology in order to be of help to the rest, they must have the discipline and objectivity of a Medical background, because only like that will those people be sober enough to stop creating castles in the sky. If not, they would only be projecting themselves unto others in order to try to understand themselves. And trust me, it’s not all fun and games what I do. I need very sober and centered humans around. I encourage anyone interested on this point to look into Freud’s work with as much detail as I did. I want my assistant to work for the Foundation, not only finding flaws in everything and everyone around.And why I prefer a woman over a man for this position? Very simple too: Because women are way more intuitive than men. And since my job is to try to help people fall in Love with the Planet, the more PREPARED (Hence I required a degree) Female energy I can be surrounded with, the better. The world is too analytical as it is, we need more poetry and feminine energy around. Maybe the world does need more poetry and feminine energy around. What Serio definitely needs around is someone to stop him from hoarding exotic animals and putting people in frightening situations under the auspices of awareness-raising.